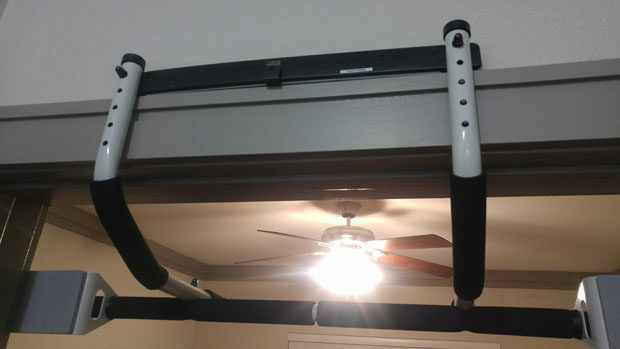 The reason I wanted to buy a pull-up bar is because I wanted to improve my upper body and grip strength, and I also wanted something I can hang from and stretch my lower back to help with my sciatica. I go to the gym fairly often and do pull-ups when I’m there, but having one in my home is a convenient thing to have. 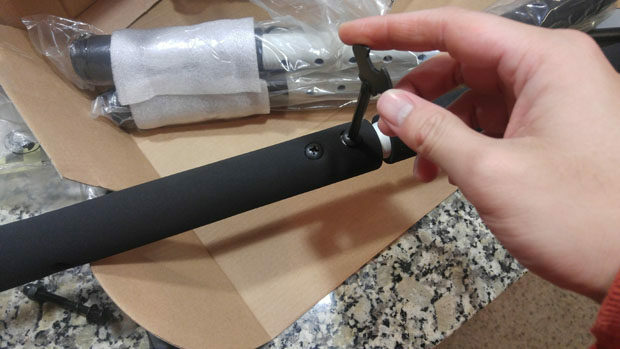 I never bought a pull-up bar before because I thought the ones that hang from the door frame don’t look very secure and safe. This changed when I tried my dad’s Multi-Gym Pro, and realized while the pull-up bar does hang on the door frame, most of the force is pushing into door frame and the wall above it when somebody is pulling on the bar. It’s actually pretty clever how the mechanism works, and since the majority of the load is pushing into the side of the door frame, the pull-up bar is reasonably secure. 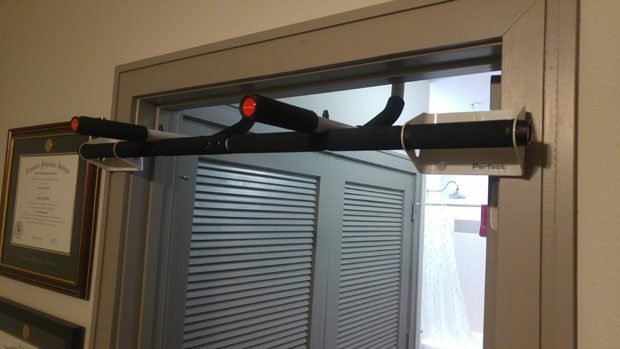 I did a little comparison shopping, and compared to other pull-up bars I looked at, the Multi-Gym Pro is nice that it has padding wherever it touches the wall, and this helps to prevent the bar from damaging the door frame or the wall above it. It also has a variety of grip positions, so you can do pull ups, chin ups and whatever-else-ups. The thing is called the Multi-Gym also because you can put it on the ground and use it for dips, but I think my couch is better for that purpose. Finally, Perfect Fitness is actually a North Carolinian company, so you could say that I’m supporting a local company . Anyways, I ended up paying about $30 + tax for it, and got it in the mail about a week later. 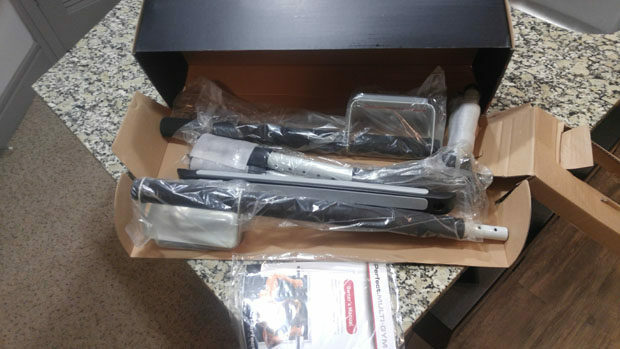 The box describes how the contraption is a multi-gym, but it’s mainly a pull-up bar. 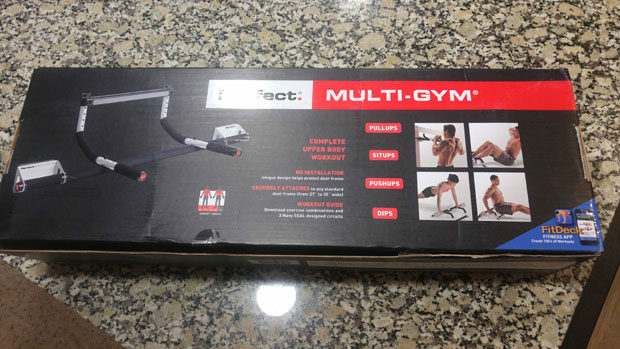 The Perfect Multi-Gym came in a good-sized box. Opening the box reveals all the parts and the instruction manual. Assembly is required and there are some screws and nuts and bolts to fix, but they include a neat little Philips screwdriver/wrench combo tool, so I didn’t have to open my own toolbox. The neat little screwdriver/wrench combo tool that comes with the package. Assembly is pretty straight-forward, and takes 5-10 minutes. Some of the nuts do require some pressure to push them in far enough through the bars and pipes so you can put the nut on other side, but otherwise nothing really challenging about putting the pull-up bar together. The Perfect Multi-Gym Pro has different holes on the curved bars to adjust for the thickness and the height of the top part of the door frame. However, you can’t adjust the width of the pull-up bar, but it should fit most doors. The doors in my apartment are wider than usual so only a small part of the main pads are in contact with the door frame. 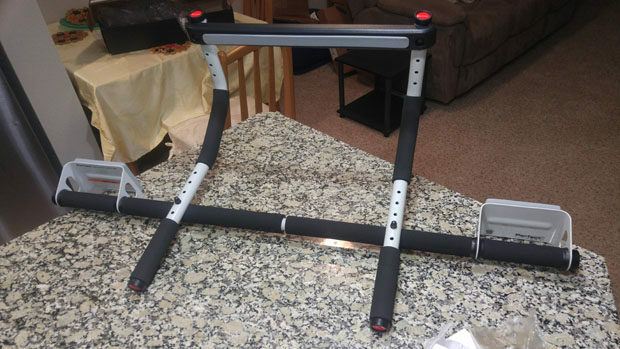 After assembling and adjusting the bar, all that’s left to do is install it on a door frame and give it a try. Before installation, there is small metal safety clip that slips in onto the top of the door frame. After the security clip is in, you just put the top part of the Multi-Gym pro on top of the door frame on the back side, and make sure the main pads are supported by the front side of the door frame. I’ve used the pull-up bar for a bit now, and it feels pretty safe and secure. Taking the Multi-Gym down is about as easy as putting it up. You can see the black safety clip at the middle on top of the door frame. So now I have a pull-up bar at my home. I probably only use it 2-3 times during weekdays, which is not a lot but it’s than before. Hopefully doing a few more sets of pull ups and chin ups will improve my upper body strength, and hanging on the bar will help alleviate my sciatic pain.